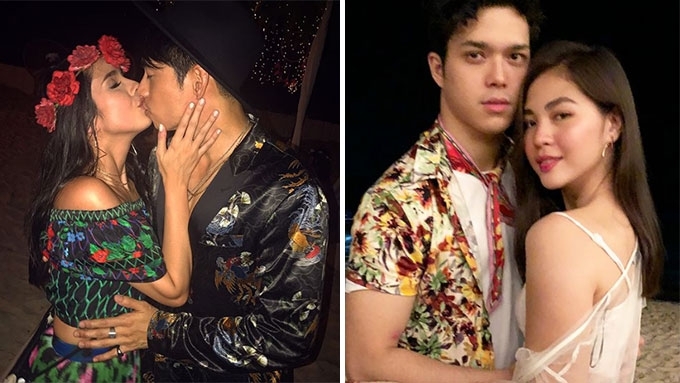 Elmo Magalona brought Janella Salvador (right photo) as his date to Maxene Magalona and Rob Mananquil's (left photo) pre-wedding dinner at the Shangri-La Boracay Resort & Spa on Wednesday night, January 10. Any moment now, longtime couple Maxene Magalona and Robby Mananquil will tie the knot in a beach wedding ceremony on the island of Boracay in Aklan. Before their much-anticipated wedding day, Maxx and Rob hosted a Coachella-inspired, pre-wedding "boodle fight" dinner at the beachfront of Shangri-La's Boracay Resort & Spa on Wednesday, January 10. The couple had attended the Coachella Valley Music and Arts Festival twice, in 2016 and 2017. Given their passion for music and their love for attending music and arts festivals, it's no wonder why Maxx and Rob picked Coachella as the theme of their pre-wedding party. The pre-wedding dinner's venue exuded a boho-chic vibe complete with tipi tents, dream catchers, wicker throne chairs, straw beach mats, pillows, string lights, and lanterns. Of course, the event would not be complete without a song number from the couple. Aside from Maxx and Rob, their guests also filled the air with kilig vibes. Maxx's brother Elmo Magalona brought his love team partner Janella Salvador as his date for the wedding. Kapuso couple Megan Young and Mikael Daez were teased: are they the next couple to walk to the altar? Megan's sister Lauren Young is among the bridesmaids. She brought her non-showbiz boyfriend, Robbie Gar, as her plus one. Model Janna Tee is also one of Maxx's bridesmaids. She was accompanied by her boyfriend Brent Javier. The official wedding hashtag, #iROByouveryMAXX, is a pun on the phrase "I love you very much" using the bride and groom's nicknames. Maxx and Rob first revealed their relationship in September 2015. They got engaged on February 14, 2017, during their trip in Japan. The couple earlier wed in a church ceremony at the Santuario de San Antonio Parish in Forbes Park, Makati on January 8.